All of the animals in the Forest know who to go to when they are hungry or frightened. Long blonde hair streaming down her back, large green eyes reflecting the love she feels, Misty the Elf Princess keeps the pockets of the green tunic full of seeds and raisins for the animal babies (and sometimes the older ones as well!). Misty understands all of the animal languages, from the sharp chattering of the squirrels and chipmunks to the gruff snuffling of the wild pigs and the quiet twitchings of the bunny rabbits. In fact, you can sometimes hear Misty making conversation with the noisy blue jays, as the birds fly overhead from limb to limb among the trees in the Forest. The most amusing sight of all, however, is watching Misty as she speaks to the fish poking their silver heads above the water in the Stream of Fantasy. Her pretty mouth opens and closes in little puckered O's, and tiny popping sounds can be heard! There is a special magic in the touch of Misty's had that the animals know and love. Once, a tiny tree frog named Clarence got separated from his mother. He lay on the ground, helpless, quivering with fear until Misty came to his rescue. She picked him up crooning a soft little melody and gently stroking his head with her finger until his fear was quite gone. Then, placing him in her pocket, she climbed the tree and returned him to his family, safe and sound once more. 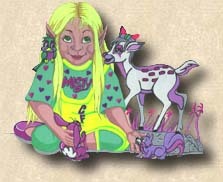 You can see why the Children of the Forest and all of the animals love Misty the Elf Princess!